Rehabilitation of old industrial land is common place today for future land re-use. Shallow drilling and geophysical borehole logging is common practise to map the location of subsurface contaminants from the old industrial sites. This project in an urban setting involved the logging of 40 shallow boreholes. Induction-conductivity logging was used to map potential contaminants throughout the project area. Common industrial contaminants can have distinctive resistive and/or conductive signature. The induction-conductivity logging was undertaken in 40 boreholes across the project area after the completion of all drilling and within shallow 50mm PVC cased boreholes. High resolution identification, correlation and mapping of sub surface contaminants. Induction conductivity data from a single investigation borehole. See the significant increase in conductivity values at depth related to an industrial contaminant. Borehole collar locations are taken from survey data. 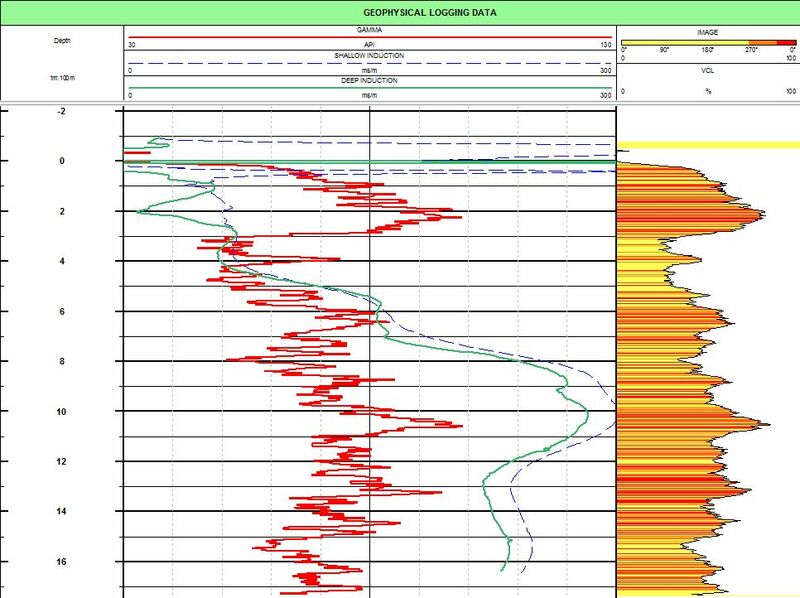 Correlation section using multiple borehole conductivity data to map the distribution of a saline industrial contaminant across the project area.